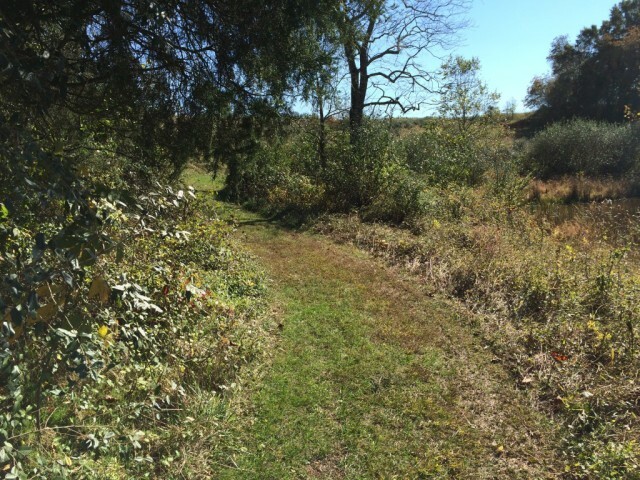 There is a hidden gem for Washington-area runners in the heart of Loudoun County — Banshee Reeks Nature Preserve. Over 20 miles of well-groomed grass trails traverse the 725 acres of grassy fields, hardwood forests, wetlands, and creeks. It’s a wonderful cross-section of the beautiful landscape that can be found in Northern Virginia. The picturesque scenery is an ideal backdrop for logging miles on soft trails. If you’re the type of runner that likes to connect with nature, this place is worth the trip no matter where in the metro area you live. The first thing that may stand out to you is the oddname, the origin of which goes back to the early 19th century. Once you experience this place, the second word of the name makes sense, given “reeks” is a Gaelic word referring to hills and dales, which are abundant. The term “banshee,” Gaelic for female spirit, begs for further explanation. A local farmer, likely resulting from an intoxicating visit to a local saloon, came back home one windy night and claimed he heard a banshee on the reeks. The farm animals and wind were the likely culprits for the sounds, but over the years the story was repeated, and the area became known as Banshee Reeks. Even better than the colorful name is the experience you’ll get from visiting southern Leesburg for a run at Banshee Reeks Nature Preserve. The preserve is approximately 40 miles west of Washington, D.C., and lies between Route 7 and Route 50 and just west of Route 15. Before you make the trek out there be sure to note the hours: weekends only from 8 a.m. to 4 p.m. Truly located off the beaten path, you’ll need to travel the last couple of miles of your ride out there via a dirt road. Drive slowly as two-way traffic on the road can be a bit tricky. Follow the sign on The Woods Road to the visitor center parking area. The visitor center is only staffed the third weekend of every month, but the parking lot is open every weekend and is equipped with a portable bathroom and water fountain. You can also get trail maps there, which can come in handy to plan your run or to take with you to guide you back to your car when the end of your run nears. Banshee Reeks is also a great place just to lose yourself in your run and enjoy the views. The marked trails are mostly well-groomed paths of grass about 5- to 10-feet wide, reminiscent of some cross country courses. Start out on any trail and be prepared for soft ground, lots of rolling hills, and plenty of great panoramas of wildlife and gorgeous habitats. The property is bordered on one side by Goose Creek and contains several ponds. You’ll also see forests of oak and hickory, meadows, and wetlands. You may also observe other residents of the preserve as you run: beaver, deer, foxes, and bats. As you head out over hill and dale on the scenic trails with names like Springhouse and Raspberry, you’ll notice the varied landscapes can change rapidly. One moment you can be in a forest with branches forming a canopy over your head and soft moss under your shoes; just a few minutes later you’ll be in a meadow with tall natural grass surrounding you, watching a hawk fly through the sky. Whether you’re running 20 miles or just a few, there will be plenty to see and delight in along your way. and you’ll have plenty of chances to locate landmarks. To be safe, you can always carry your trail map. Enjoy running across the stunning landscape, but do be courteous while doing so. Runners are the minorities here and most visitors to the park are birdwatchers, hikers or photographers, so enjoy the sights and sounds of Banshee Reeks without disrupting other from doing the same. Additionally, due to the ecological studies occurring through the preserve, stick to the trails. Other park policies include not intruding upon the wildlife and to leash your pets at all times. No bikes or horses are allowed on the trails. Banshee Reeks Nature Preserve is for you if you love running on grass, you like to take in some pleasant views on your runs, you like reliving your cross country days, or you want a nice quiet place to run a hilly long run on soft surface. It’s also an ideal place to cross-train with a hike on your own or with friends and family to take in the beauty of the preserve. Banshee Reeks is a trash-free preserve and encourages visitors to take only photographs and leave only footprints. Please do leave many footprints and enjoy a long run here. This article originally appeared in the January/February 2014 issue of RunWashington.